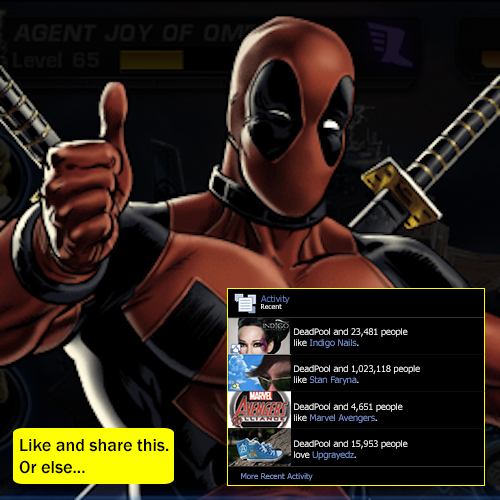 It has been estimated by seers, accountants, and Kafkanesque bureaucrats 200 hours is the average number of hours that the non-gold using players among the 1% put into getting DeadPool, the infiltrator schematics, and all the other goodies as advertised for the nearly completed DeadPool PVP Season. That is [bleeping] insane! Also infernal is the Spec Ops gear – all junk. The word, Catch 22, describes a FUBAR paradox in which you are stuck between a rock and a hard place. 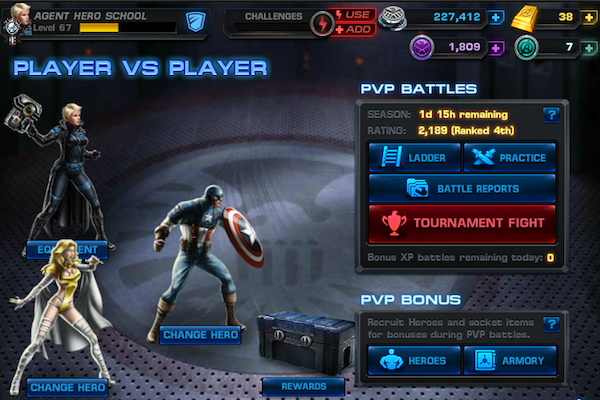 As most Marvel Avengers Alliance players currently find themselves unable to make ground or hold ground in the current PVP tournament, it seems appropriate to drag out the word, Catch 22. 5. If you don’t have Quantum Jumper (Level 65+), buy it. Yesterday. 6. If you don’t have Cosmic Flame, buy the Ankle Biter. 8. Don’t fall asleep on the job! Pay attention! Looking at the stats of the Cosmic Flame leaves one underwhelmed. But it turned out to be one of the epic gears for PVP – if you knew how to use it properly. 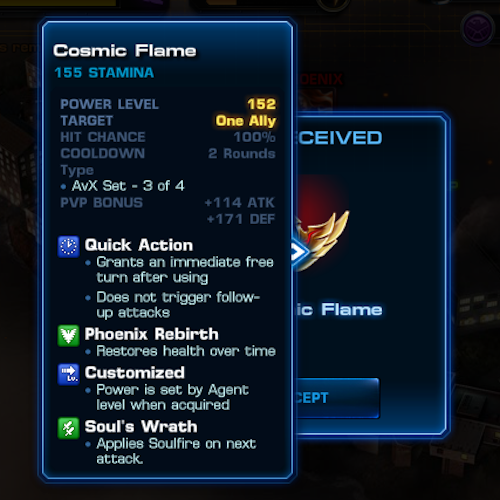 If you don’t have something to do the same thing in PVP, hopefully you have Cosmic Flame in your inventory and you’ll equip it immediately (regardless of it’s power level) – if you have not already done so. If you don’t have Cosmic Flame, Anklebiter is worth 64 Gold. And if you are a subscriber to The Hero School Review, you know that I rarely say things are worth 64 Gold. Remove Buffs works like Soulfire without the DOT (Damage Over Time). It removes “special protect” buffs – so you can kill that agent faster. In the last hours of the DeadPool PVP Tournament, Anklebiter’s Remove Buffs sometimes failed to remove Shield Guard. That is a bummer for all those players desperately trying to hold on to their league. Yet another Playdom bug that cause considerable grief. 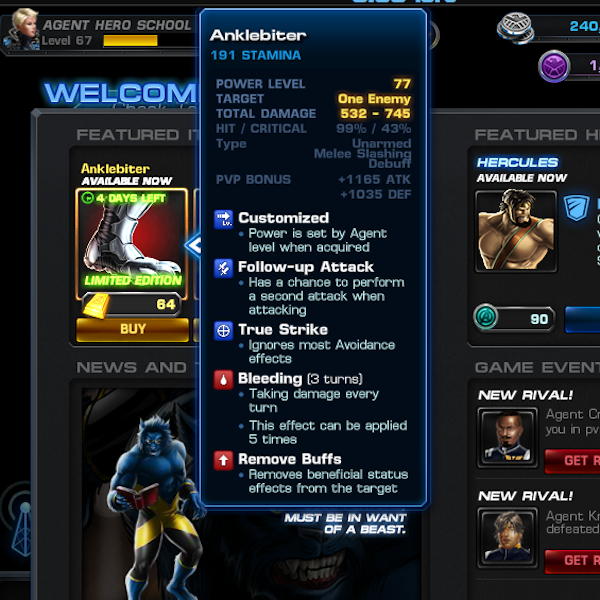 Players who recently purchased Anklebiter should request a Gold refund from Disney-Playdom. 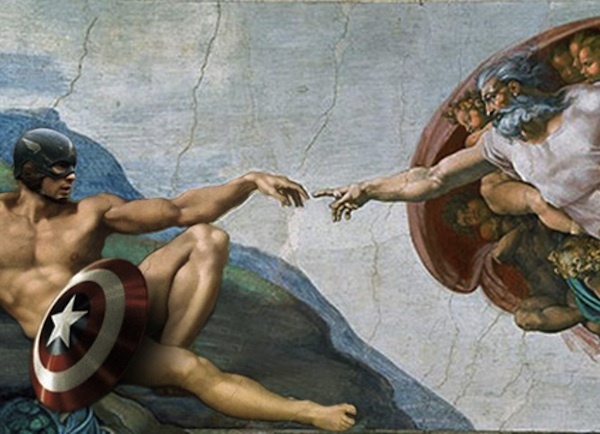 This entry was posted on Sunday, November 4th, 2012 at 10:27 am and is filed under Games. You can follow any responses to this entry through the RSS 2.0 feed. You can leave a response, or trackback from your own site. happy birthday i wish i was as smart as you ,when i was 43. i’m 50 now. Thanks Douglas – you’re very kind to say so. I still eff up and often. Working on improving that – just as I am sure you are. Happy birthday Stan! Thanks for the advice, too bad I can’t buy the Anklebiter right now. What’s your opinion of Hercules, o techno-bohemian master? Thanks Oscar. Hercules is almost epic. Something needs to be fixed, but I haven’t decided what. Ghost Rider, on the other hand, may be worthy of PVP. Happy Birthday, dude. I enjoy reading your blog for the specific advice on how to improve my MAA game and the thoughtfully written and philosophical musings / entries. Keep up the good work. Mephisto and the Epic Boss will sustain some damage after their health is gone. Just keep your heroes alive a little bit longer. Thank you for your previous entry on PvP tourney. I play MAA since May and i have been very scared and annoyed on PvP topic. Your take on PvP is a good wake-up call for me. When PvP tourney start, i think at most i can only finished on Diamond League but after i read your post, i can stand up and fight on PvP despite my less-than-average resources(all player on my level already have most hero recruited and at minimum lv of 10 while mine is only about 3/4 of all hero and at maximum lv of 10). I was able to finished on Vibranium league. Congratulations on your birthday and once again, thank you. Congrats Ahmad, well done and thank you!